I used to have a vegetable garden. It occupied a space of about 15 by 25 feet across the path from two perennial beds. It was (and for that matter, still is) laid out in a pattern of diagonally bisected squares I had copied after reading an article about Rosemary Verey’s garden in England. (By the way, the triangular beds that result from this are the devil to dig and plant). There is an apple tree (Yellow Transparent) almost but not quite in the centre of the back part of the patch. 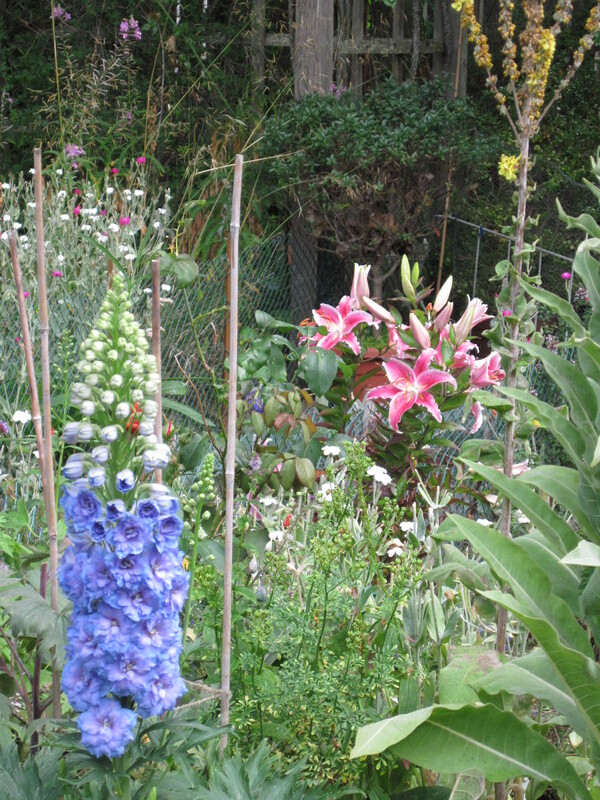 It’s surrounded by different kinds of mint, with a solitary clump of fennel to one side. A triangle in the middle of the layout is occupied by plants of lavender, hyssop and thyme. 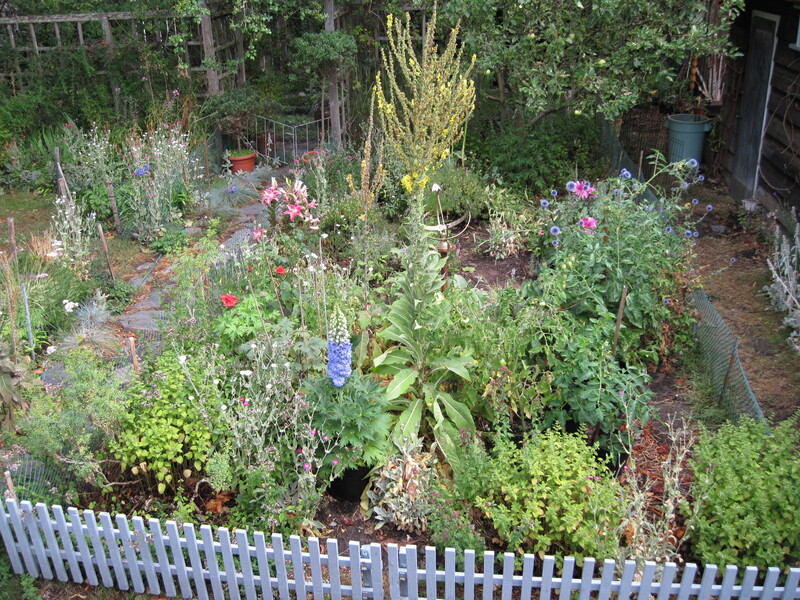 Others host rue, oregano, echinacea and more mint, while one triangle is given over to a couple of rhubarb plants. Vegetables (tomatoes, spinach, chard, lettuce and peas) used to grow in the space that remained. After a few years, I noticed that the tomato plants were smaller every year, and less productive. The soil was always dry. The obvious reason was the two Norway maples 20 feet to the west of the veg patch, and the Ailanthus (“Tree of Heaven”) to the north. These tough, pushy trees were sending roots into the patch and hogging the water and nutrients. The obvious cure for this unhappy situation was removal of one or all of the trees. Tree removal, however, is costly and disruptive. The trees are still there and the vegetable patch is now the ex-vegetable patch. Self-sown quasi-weeds (campion, toadflax, echinops and mulleins) have moved in, along with plants I’ve moved there for lack of better places, such as spare echinaceas and a big mauve dahlia whose old spot had become inhospitable. 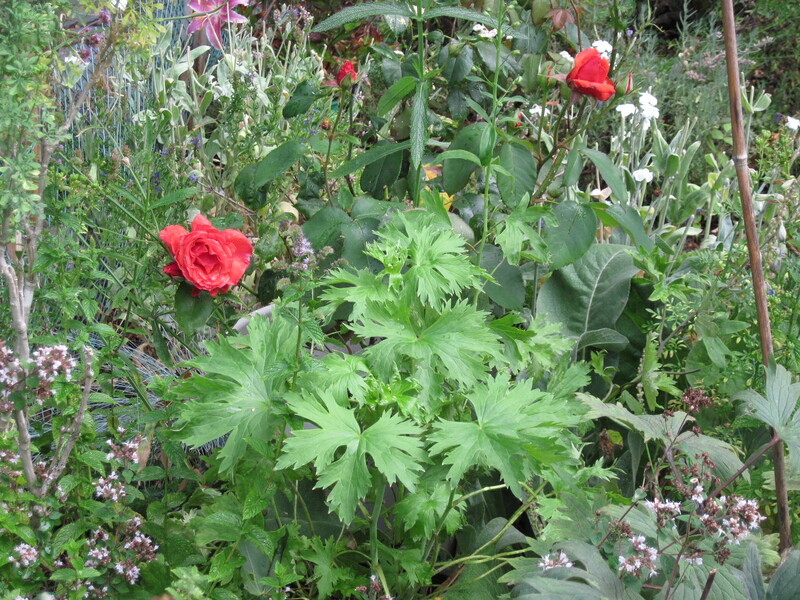 I’ve also parked some potted delphiniums and lilies near the feeble (but intensely fragrant) rose “Fragrant Cloud,” which also lives in a pot. Right now, despite the drought and possibly because of the hot summer, the ex-veg patch looks pretty good. 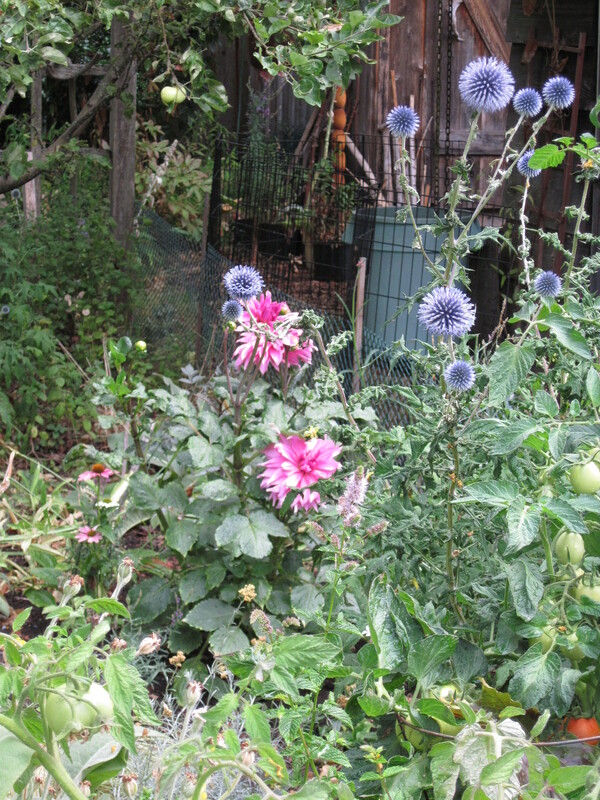 Transplanted mauve Dahlia and self-sown Echinops. Second set of blooms on rose “Fragrant Cloud” and new growth on potted Delphinium. What about vegetables, you ask? Well, there are four potted tomatoes, along with all the other stuff. (Of course, tomatoes are technically fruits, but that’s OK).